A lot of fans have been asking D Wizzle's World for the pictures of Cleveland Indian Grady Sizemore that have been floating around the internet since yesterday. We won't post the pics up here but here is a link below to all the pictures. Select tickets for Strikeforce's Evolution show on December 19th in San Jose, California are 25% off until November 30th. MMA fans can purchase tickets here. The promotional code to enter is TTS09. This show will be Strikeforce's last big show in 2009, and it should be a great night of action. Paul Pierce of the Celtics lands a flying knee MMA style on Chris Bosh of the Raptors on his way to the rim for the big dunk. 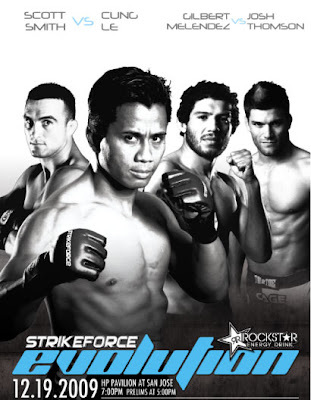 Strikeforce has a show tonight live on Showtime starting at 8pm on the West Coast. Casey might be accompanied to the cage by Spencer Pratt of MTV's The Hills. Pratt is Casey's manager. The most interesting match-up tonight is the female fight between Couture and Vera. Couture's ex-husband, Randy, and Vera's husband, Brandon, fought last Saturday night in England at UFC 105. Couture won by decision over Vera in that fight. Many fans expect Kerry to win tonight but they should not underestimate Kim. Kim has been training very hard in Vegas for this fight and she is very determined to put on a great performance. Strikeforce will have a big show next month in San Jose, California called "Evolution." Tonight's show is one of their smaller shows and is part of their Strikeforce Challengers series. The series is meant to show off the up-and-coming fighters in the MMA world. 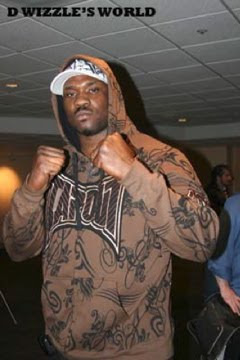 Meredith DiVita interviews Anthony "Rumble" Johnson in this two-part interview. Johnson is fighting Josh Koscheck at UFC 106 Saturday night in Las Vegas. Here is John Wall's game winning shot against Miami of Ohio. Wall is the best freshman in the NCAA and will be a top pick in next year's NBA Draft. Please do not read any further if you plan on watching tonight's UFC 105 broadcast on SPIKE TV on tape delay and don't want to know who won. I don't want to spoil the results for anyone that doesn't want to know the results until they watch tonight. First match on the main card is Aaron Riley vs. Ross Pearson. Riley is being cornered by Greg Jackson and Joe Stevenson. Pearson came out to Black Eye Peas "I Got A Feeling" song which Stevenson came out to to the cage to last month against Spencer Fisher. Pearson wins round one. He picked apart Riley with knees, kicks, elbows, and punches. Pearson wins in the second round by TKO due to the referee's stoppage after a flying knee landed on Riley's face. Riley was bleeding very badly after the knee landed. It was a very impressive win by Pearson. The fans in Manchester, England are very happy that he won. James Wilks vs. Matt Brown is up next. This should be a great fight. Fighter introductions just ended and we are about to start round one. Round one just ended. Very competitive round. Wilks got a takedown in the final seconds but could not do anything with it. Brown wins round two as he used a flying knee to knock Wilks to the mat. Wilks recovered and prevented Brown from finishing him a few times in the round. He even got on top of Brown with about 30 seconds left in round two. Brown defeats Wilks by TKO in the third round. He got full mount and landed many punches before the ref stopped it. Wilks attempted a kimura right before Brown got out of it and got full mount on Wilks. Brown said after the fight that he was jet lagged and tired from the trip over to Manchester. They just showed the prelim fight between Andre Winner and Roli Delgado. Winner is the winner as he KOs Delgado in the first round. This probably will be the Knockout of the Night. Winner landed two unnecessary punches to Delgado when Delgado was already out cold on the mat. This might be Delgado's final fight in the UFC since this is his second loss in a row. Michael Bisping vs. Denis Kang is up next. Kang wins round one after rocking Bisping with a right hand. Kang got side control and full mount but Bisping did a great job of defending on his back. Bisping destroys Kang in round two and wins decisively by TKO after taking down Kang three times in the round. Bisping used his ground and pound to punish Kang after the takedowns. The ref stopped the fight after Kang was on his knees trying to block Bisping's ferocious punches. This was a great win for Bisping. Bisping needed a good victory after losing by knockout to Dan Henderson in his last fight. They just showed another prelim fight between Alexander Gustafsson and Jared Hammen. Gustafsson won by TKO. After hitting Hammen with a straight right sending Hammen to the mat., Gustafsson landed a few more shots on the fallen Hammen before the ref stopped it. The fight ended after 41 seconds. Mike Swick vs. Dan Hardy is up next. Some fan stole Swick's hat as he was walking down to the cage. The introductions are going on now. This is a very boring first round. Swick is going for takedowns and Hardy is defending with his back against the cage. Hardy wins round two by landing a lot of good shots on Swick. Swick's legs buckled but he recovered after Hardy kept on attempting a takedown. The fight is now over and Hardy will win by decision. He controlled the third round and landed more good shots on Swick when they were on their feet. Hardy landed more good shots and got the better of the stand-up in all three rounds. Swick looked more tentative today than in any other fight I have seen him in. Georges St. Pierre came into the cage after the fight to shake Hardy's hand. UFC announcer Mike Goldberg said that St.Pierre and Hardy will fight for the UFC welterweight title. The main event is up next between Randy Couture and Brandon Vera. A fan stole Couture's hat while he was walking down to the cage. Security needs to do a better job of not letting this happen to the fighters when they walk down to the cage. This is a very boring first round. Couture had Vera against the cage for the whole round and nothing happened after that. Vera wins round two by doing some damage to Couture with kicks and punches. Couture hasn't done anything but clinch with Vera and putting him against the cage. Vera looks exhausted as the third round ends. I have Vera winning this fight by winning the last two rounds. Vera used more kicks in round three while Couture tried to clinch with Vera again. This fight was very boring and this fight made the Lyoto Machida vs. Shogun Rua fight last month seem action-packed. The judges give the fight to Couture 29-28. What a terrible decision by the judges! I don't agree with the decision at all as Vera did more damage than Couture. Vera is angry and sarcastically thanks the judges after the fight in his interview with UFC commentator Joe Rogan. The show is now over and the next UFC show is next Saturday night In Las Vegas, Nevada. I will give the edge to Vera because he is younger and in his prime while Couture is 45 years old. Youth wins this one. Vera is motivated for the fight and trained very hard. Vera will win by unanimous decision over Couture. Swick is the favorite to win and I expect him to do just that. If Swick wins tonight, he will be on track to face Georges St. Pierre for the welterweight title next year. Swick by TKO in the first round. Bisping doesn't want to lose in front of the home crowd. Kang has to win by KO or submission because the judges in England will probably give the fight to Bisping if it goes to a decision. I say it does go to a decision and Bisping wins. It won't matter if Kang picks apart Bisping all three rounds because the judges will most likely still give the fight to the local fighter, Bisping. I like watching Brown fight. He brings it every time and shows a lot of toughness. Wilks was on TUF 9. This will be a competitive fight and I see Brown winning by split decision. 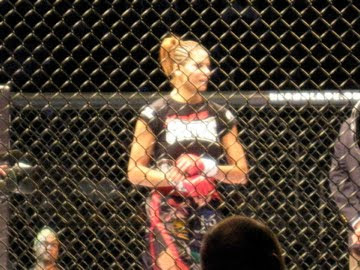 Riley is a MMA veteran with 39 professional fights (28-11 record). Pearson is 11-3. I'll give the edge to the veteran Riley. Riley by split decision over Pearson. Hathaway is undefeated with a 12-0 record. He is a promising prospect in the welterweight division. Taylor is very scrappy and this is going to be a great fight. Hathaway by rear naked choke in the third round over Taylor. Etim is 13-2 and Gugerty is 12-3. Both of these fighters like to use submissions to win. Etim by rear naked choke over Gugerty in the second round. Gustafsson is 8-0 and Hamman is 11-1. This looks like a competitive match on paper. I'll go with Gustafsson by TKO in the first round. Six of his wins have come by knockout. Winner is more athletic of the two and I will take him to win by split decision. This is a video of Will Bynum dunking on the Charlotte Bobcats a few days ago. Bynum is only about 5'11 but he sure can get up. This is the monster dunk from Dwyane Wade last night on Anderson Varejao. Here is a video of CAL RB Jahvid Best scoring a touchdown but landing on his back against Oregon State. It was one of the scariest injuries I have ever seen. NEW YORK (November 3, 2009)--Jason "Mayhem" Miller has already shown the world that he's no fan of bullies. Now, the host of MTV's smash-hit reality series "Bully Beatdown" has been joined by fellow STRIKEFORCE mixed martial arts (MMA) stars Scott "Hands of Steel" Smith and Daniel Cormier in a national campaign led by apparel company and cause organization Kickin' It, Inc. to curb a perennial problem amongst adolescents and teenagers. Founded by Kickin' It Apparel Co. President GinaMarie Raimondo in May 2009, the "Bullying...We're Kickin' It" campaign aims to stop bullying amongst youth and the resulting psychological and emotional wounds often left on victims. Raimondo's outfit aggressively engages students, their guardians, and school faculty in useful dialogue and activities, including workshops led by the organization's spokespeople in order to encourage positive behavior. Smith and Cormier will pay visits to several Chicago schools and youth centers this week while Miller readies for his highly-anticipated, live network television debut on CBS this Saturday, November 7 when he will face off with fellow superstar Jake Shields during the STRIKEFORCE and M-1 Global co-promoted "Fedor vs. Rogers" event at Chicago's Sears Centre Arena. "I'm enthused to be a part of something like this that's bigger than just fighting and bigger than just a TV show," said the 28-year-old Miller, who has already recorded a number of public service announcements on behalf of Kickin It's campaign. The messages are being broadcast nationally courtesy of Premiere Radio, a subsidiary of Clear Channel Worldwide. "I want to bring about positive change amongst the youth in this country and this is a way to do that." "I was bullied as a kid so I know what it's like to be belittled and humiliated in front of my peers," said the 30-year-old Cormier. "I want to make a difference in the lives of kids who are facing the same things I did when I was their age." Smith's status as a father of two boys, ages 12 and 6, has heightened his sensitivity to the problem. "It hasn't happened to either of my kids yet, but that doesn't mean it couldn't happen in the future. It's something that concerns me and I want to do whatever I can to influence kids in a positive way." "Bullying is a very serious problem in every school across America that has long lasting, detrimental effects on your youth," said Raimondo. "This problem requires an integrated approach involving the entire community to unite against this kind of behavior. Kickin It's campaign offers that and hopes others will follow the example of the STRIKEFORCE athletes who should be admired for their passion and determination to address this issue." NBA TV's Rick Kamla calls Nets' Yi Jianlian a racial slur around the 50 second mark of the video.He should be fired or suspended. He calls Jianlian "The Chinaman" and thinks he can get away with, and sadly, he probably will. Racism is alive and well in 2009. Strikeforce had a media conference call earlier this morning with Strikeforce President Scott Coker, Brett Rogers, and Fedor Emelianenko to promote their November 7 show. Coker: "If Fedor was living in America, we would take him on a lot more shows." Has no interest in Fedor's brother, Alex, because he has issues with the sports commissions right now and is not cleared to fight. Expects the show to be fully sold out by Saturday. They are 85% sold out right now. Rogers: Does not think Fedor is underestimating him even though he got married recently and doesn't think Fedor is taking him lightly at all. Has studied tape of Fedor to prepare for the fight. Has trained for three months for Fedor and feels like he knows him. He is waiting for Fedor to try to take him down and he does not think Fedor will want to stand up with him for very long. "I am coming into the fight as the bigger, stronger guy." "I don't work at Sam's Club anymore." "I am getting movie and TV offers." Was supposed to be on MTV's Bully Beatdown show but he didn't have time. "I always wanted to do this. This is my life." Feels underrated because he is a big underdog. He hopes for more respect after the fight. Expects a quick finish to the fight. Does a lot of mediation before the fight. "The day of the fight is nothing. I sleep up to the point of the fight." "I am hoping the fans cheer me on too since I am actually from Chicago. I have a lot of friends coming from Minnesota to cheer me on." Fedor: Says he gets nervous one day before the fight because he is a human being. He found the NFL game yesterday in Chicago to be interesting but the games on TV are more exciting. "I don't think I would have enough energy to play and I don't know the rules very well." Expects the fans to cheer Rogers since he is from Chicago. He has experienced fights where the fans have cheered his opponents more than him. Does not train with any American fighters. He just works with his coaches. "I really like having fights in America."